"Dissolved uranium from Sokli mine would flow this same route to Bothnian Bay as You're now canoeing!" Several foreign companies are about to attack unique Finnish natural environment. Not even Santa Claus is left alone as Yara plans to build the huge Sokli phosphorus and uranium mine near Santa’s mountain Korvatunturi. Yara´s decision whether to put its plan into effect is expected this year. The Sokli area is located in Eastern Lapland between the Urho Kekkonen National Park and the Värriö Nature Park near Korvatunturi, the home of Santa Claus. The area further includes the famous Tuntsa wilderness and three Natura Network locations. The Norwegian public company Yara International is planning a phosphorus and niobium ore mining project in Sokli. There the phosphorus ores contain tenfold amounts of radioactive materials like uranium, thorium, radium and polonium compared to normal Sokli levels, the niobium ores even 200-fold amounts. Covered by soil these radioactive materials are quite harmless, but during mining operations they are freed into the nature. Many uranium compounds are water soluble and spread easily with dust and drainage water into nature, where local inhabitants collect natural products like berries and mushrooms, reindeer is herded and ecotourists and fishermen wander in nature reserves. Uranium mining would destroy Lapland's unique tourism brand that local people have been succesfully building up for decades. The Sokli mine would be situated in the Savukoski community, Eastern Lapland, in the middle of a central reindeer herding area where herding is still very much alive keeping many villages inhabited. Young families have been investing in their livelihood and building their future on reindeer herding. When realized, the mine would completely destroy the traditional reindeer herding based on natural pasture. The company intends to build a huge wastewater basin in the middle of wilderness. From there wastewater would be drained via Nuortti River to Russia and via the giant Upper Kemi River to Kemi Lake, to the mainstream of Kemi River and finally to the Gulf of Bothnia, which is the northernmost, still quite clean part of the Baltic. Mud would fill the basins and destroy the recently restored spawning areas of many trout species. Politicians and decision makers have the tendency not to recognize these threats to the nature, economy and culture. They are onesidedly and quite shortsightedly driving only the interests of mining companies. The mines would at their best function only couple of decades and after that a large part of eastern Lapland would be a polluted area, a radioactive waste depository. The prospective Sokli mine would be an open pit mine with an area 6.6 km², the whole mining area being 14 to 41 km². The radioactive elements like uranium, thorium, radium and polonium are found in in Sokli's ore bodies at levels 10 to 100 times the normal. 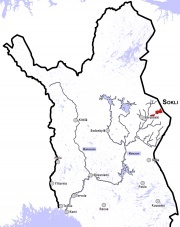 The Sokli area is located in Eastern Lapland, between the Urho Kekkonen National park and the Nature Park of Värriö, in the neighborhood of Korvatunturi, the home mountain of Santa Claus. Also the famous Tuntsa wilderness and three Natura network locations are nearby. Enabled by the poor and old-fashioned Finnish Mining Law companies have attacked the virgin and uniquely beautiful Finnish nature, wherever the bedrock happens to contain uranium. Now even Santa Claus is disturbed by Yara´s plans for the nearby Sokli phosphorus and uranium mine. 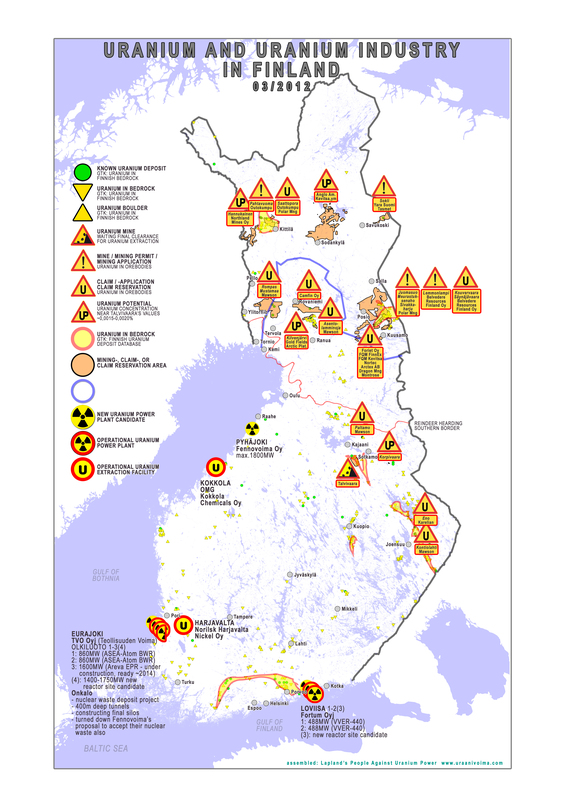 Please send polite letters of concern about the Sokli mine and in general about the effect of the attack of uranium mining companies to Finland`s nature and tourism. This page was last modified on 23 December 2015, at 13:24. This page has been accessed 16,627 times.